If anyone is interested, I have been working on CQ IV for a few weeks and have a solve to share. I want others opinions as to if my thinking is sound. I'm not interested in going to the treasure, but want to help someone who does. Hi Wiggles, I would be interested. If it is somewhere close for me to check out for you, and I feel your solution is sound as well, I would be happy to. The prize would be yours.... I would just love the search (if able). I put this one aside because I was stuck, and couldn't progress any further. It would be great to hear some new theories, and start discussing CQ4 again. I signed up as a full member, so my member name is wiggles6854 instead of just wiggles. But here is my solve for CQ IV. Five times=the number of times SF has been hit by an earthquake. fort=the Presidio, California's oldest fort. fleet=the Navy fleet docks there...they even have Fleet Week every year. areas of import=large shipyard and customs area. pleasently cool=SF is cooled by the oceans breeze. Bigfoot= SF being in Northern California, has a Bigfoot following, they have a Bigfoot Bonanza every year....but that was started after CQ IV had been published. Specifically I think it is in Buena Vista Park. If you look at a map it is in the middle of a neighborhood with a children's playground and a wooded walking trail. There is a part of the story that has the words "only one" You can make that into "on Lyon" by dropping the letter e.
Buena Vista park intersects Lyon St. And an entrance to the park is at this intersection. I'll continue with directions to the inside of the park, but remember after Custard hit his head "everything seemed turned upside down" and he viewed " all of the clues from a different perspective " so knowing this I think beneath =above, bottom =top, and fake=real. So "little z buried beneath"=little z buried above. The history of Buena Vista park is that it is the oldest park in SF. 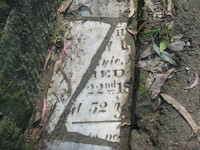 And they reused pieces of tombstones to build gutters along some of the walkways. Some of the pieces are turned to where you can see the writing. There may be a Little Z or Little A if you use my opposite theory. The photos that I have seen of the gutters show a wall next to them, so the stone would be buried above the tombstone piece. The rest of the directions from the story and with the opposite parts included are as follows...this is starting from the Lyon St entrance. If you look at Google street view you can see the steps and the path at the top and to the right that leads up to the walkway with stone or wood steps. As you walk up the path the playground comes into view, but it is down low and you would see the top of the equipment first. Once above the playground there is "the edge of a wooded area about fifteen feet away". Here is where the tombstones are. Lastly Custard like the paranormal and with the tombstone pieces and this park is rumored to be haunted, I think it matches pretty closely. Let me know what you think. I know the author said this hunt was different, but I think the clues are meant to get you close but not exactly where the stone is buried like the other hunts. I just read the thread called Two Justin's. In SF there is a popular local DJ called Justin Credible....which is a reworking of the words in CQ IV " just incredibly "
Its good to see you working on this one. That is some nice theories. I like your theory very much. This has been a difficult quest to crack. Perhaps you will be the one to do it. - There are suburban playgrounds like the one described here outside of practically every American city. There is a suburb near where I live, for example, where almost every block has its own interior playground/"natural area". That's not really helpful but it does not seem to fit anywhere in San Francisco. - This would include the suburbs of Oklahoma City, which is the site of the fake "Johnston's Family Diner" web site (more on this in a bit). - There have been Warrior Dashes in many, many places. (Although the people I know who have competed in them have traveled quite a distance, so a medal by itself does not even mean you would be in a Warrior Dash city). - The "uninteresting flat plastic square...the size of three stacked iPads with a circular fixed-bottom base and three small posts arranged in the shape of a triangle on top" seems important. An architectural reference? - The most oddly worded sentences include: "the blood of the condemned boiling over steps inside the devil's home" and "Foreseen Eggs and Scram". - bigfoot or sasquatch or Gigantopithecus or Jersey Devil or Harry - these are quite unrelated creatures/legends, and what is meant by Harry? - None of the foods eaten by the Marks family (mashed potatoes, corn, rolls, fried chicken) are actually on the Johnston's Family Diner menu. - I assume the Johnston's Family Diner web site is related to this puzzle. It has the feel of a web page built for some "design your own web page from scratch" class, but it's just too odd to be that. Regaine, I'm glad to see you here. I believe the plastic triangle was a base for the tiara or crown mentioned in the story. It could still be a hint of some sort. I asked custard about the okc website and he wouldnt say. Good luck. Let's get this going. You're right, it's the base for the tiara. Probably nothing more to it than that. Regaine, there is a thread that is titled, "What is the Mystery Object? ", however, it doesn't go into much more detail than here. It is always nice to have new ideas on an old unsolved hunt. Welcome! Thanks, I had not read every thread, obviously! I'm more pessimistic about the significance of the Johnston's family diner website. The tremendous number of misspelled words is inconsistent with how CustardQuest is written. There is no overlap with the story at all, beyond the name. There is nothing interesting about the "tickets". (Is that a midwestern thing? I always knew them as "receipts".) The story does not feel like it is set in Oklahoma - it really does feel like New Jersey, as has been noted elsewhere. Maybe just the name Kayla is significant? I certainly agree with everything said. The diner website is surely not meant to be used. No phone number, address, typos. Why say look at the tickets? I could see how the website could have been a possible assignment for a student- but why look at the tickets? KML RMZBO OX DYN ZYCD. That's not enough for me to solve. The times and numbers on the tickets don't seem to contain any information that I can discern. One of the tickets doesn't sum to the correct total (off by 99 cents).